Rajasthan Interim budget 2014-15 Highlights, Full Budget: Rajasthan Interim Budget 2014-2015 was presented by the Chief Minister of Rajasthan Hon. Vasundhra Raje in the Assembly of Rajasthan. 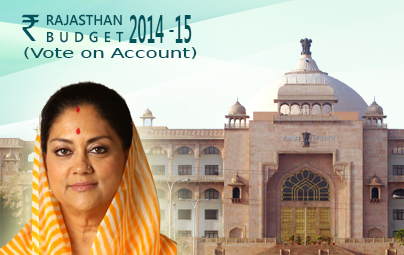 She present 1st Financial budget of Rajasthan after formation of New Government in December 2013. Rajasthan Chief Minister Vasundhara Raje on Thursday presented an interim budget without any new tax or relief for the first quarter of fiscal year 2014-15, while laying emphasis on controlling the revenue and fiscal deficits estimated at Rs.2,505 crore and Rs.18,301 crore respectively. Ms. Raje, who also holds the Finance portfolio, said in her budget speech in the Assembly that the fiscal deficit was likely to be 3.56 per cent of the Gross State Domestic Product (GSDP) of Rs.5,13,688 crore, which was beyond the ceiling of 3 per cent laid down by the Fiscal Responsibility and Budget Management (FRBM) Act. “The total expenditure during 2014-15 has been estimated at Rs.1,12,955 crore. Against the revenue expenditure of Rs.90,752 crore, the revenue receipts will be Rs.91,483 crore. We are committed to bringing the fiscal deficit to less than 3 per cent of the GSDP,” she said. Ms. Raje later told journalists that the government would continue work on the oil refinery project in Barmer district and the Jaipur Metro Rail Project, started by the Ashok Gehlot regime, with revised budgetary allocations.